In the first part of this article, we examined what happens at an Arraignment from the beginning, when a Defendant is advised of the Charge against him or her, and the Penalty that can be imposed for that Charge, as well as how the Court advises the Defendant of his or her Constitutional Rights, to how a Plea is entered. In this second part of the article we will examine the setting of Bond, the imposition of Bond Conditions, and how and why a Court will inform the Defendant of his or her next Court date. In an earlier Blog Post about Bond and getting out of Jail, we examined the Bond Process, particularly the money aspect in detail. Here, we’ll examine the mechanics of the setting of Bond and Bond Conditions more than the money considerations we discussed in that earlier Blog article. As a Criminal Defense Attorney, I have the opportunity to observe and participate in these proceedings from a slightly more detached position than my Client, who may well be too nervous to recall much, if any, of what happened, once they walk out of Court. As we proceed, we’ll be using the example about the person arrested and taken to Jail for Possession of Marijuana in the City of Warren from the first part of this article. Let’s go back to that Possession of Marijuana example from the first part of this article. Remember, our imaginary Defendant was arrested in the City of Warren for Possession of Marijuana and has spent the night in Jail. Now, they’ve been brought to Court and before one of the Judges. After advising the Defendant of which Law he or she is charged with violating (in our example, either the City of Warren Ordinance or the State Law) and what the maximum possible penalty is for that violation, and after making sure the Defendant has been provided with either a verbal or written explanation of their Constitutional Rights, and that they understand them, and then entering a Plea on behalf of the Defendant (usually “Not Guilty,” sometimes “Stands Mute,’ and hopefully not, in any case, “Guilty”), the Judge looks to set Bond. The terms “Bond” and “Bail” have come to have similar meanings, which is an amount of money posted with a Court to get a Defendant out of Jail. Let’s take a detour from the example we’ve been discussing for a moment. Let’s say that rather than having been arrested and spending the night in Jail for Possession of Marijuana, the person instead had their Marijuana confiscated and was issued a Citation (Ticket) instructing them to call the Court within 10 days from the date it was written. Or, let’s say that the person was taken to the Police Station, booked, and then let out of Jail after posting an “interim Bond” of $100 or so, or just let go without posting any money, but, in either case, was still issued a Citation. So the difference as we have described it is that in the original example from the first part of this article, where out imaginary Defendant spent the night in Jail, he or she is being brought over to Court by the Police, and in the other two examples we’ve just mentioned, the Defendant has come in on a specified date after calling the Court and either receiving a Notice in the mail or being told when to come in. In all of the above cases, the Arraignment process will follow the same order, except that for those Defendants already out of Jail, the likelihood that any additional money will be needed for them to walk out of Court is pretty slim, whereas the person in Jail may (or may not) have to come up with some money in order to get out. Again, the process of determining the amount of Bond goes beyond the scope of this article, but is addressed in the previous article mentioned above. Perhaps the most important reason that a Court would not impose any additional Bond amount upon those Defendants who appear voluntarily is just that; they have appeared voluntarily. If they were going to “skate” and blow the Court off, they’d probably start by skipping out on the Arraignment. Beyond requiring an amount of money to get someone out of Jail, Bond comes with certain conditions. These are, not surprisingly, called “Bond Conditions.” Thus, turning back to our arrested-for-Possession of Marijauna example again, even if the Judge lets that Defendant out on a “Personal” Bond (meaning no money needs to be posted for the Defendant to be released from Jail), certain conditions, or requirements, will be part of the Defendant’s release. The Judge will instruct the person that he or she cannot leave the State of Michigan without prior permission from the Court. The person will likewise be under an obligation to immediately notify the Court of any change of address. The Defendant will be prohibited from using any drugs whatsoever except under the direction, and with a prescription from a licensed physician. The Defendant will also be required to not consume or use any alcohol, and testing for drugs and/or alcohol may be required. In Domestic Violence Cases, it is standard practice for the Court to impose a “no contact” provision as a Bond Condition. This means that the person charged with the crime is forbidden from having any contact with the alleged Victim. You can imagine all the difficulty this causes, especially in cases where the Defendant is the Husband, and the alleged Victim his Wife. Suddenly, the Defendant is not allowed go back to his own home, not allowed to even talk to his wife, and finds himself cut off from his family and his possessions. Despite those complications, I’ve never seen a Domestic Violence case where a “no contact” provision has not been a Condition of Bond. Of course, it is common practice for lawyers to seek a modification of that condition, and many Courts are willing to withdraw that condition if the alleged Victim is in Court and satisfies the Judge that they no longer fear for their own safety, or that of their family. There is really an endless list of conditions that a Judge or Magistrate can impose as a condition of a Defendant’s release from Jail. The larger point here is that whatever a Defendant has been ordered to do, or not to do, as a condition of Bond, must be followed. If a Defendant fails to comply with any of the conditions of Bond, and the Court finds out about it, they are liable to have their Bond “Revoked” and sit in Jail while their case moves along. Finally, the Court will either set a date for the Defendant’s next appearance, or, in some Misdemeanor Cases, at least verify their address and inform them that notice of the next Court date will be sent to them. In Felony Cases, by law, the Court must set the next Court date, called a “Preliminary Examination,” within 14 days from the date of the Defendant’s arraignment. Anyone charged with a Felony will be told of their next date during the Arraignment. The 14 day rule does not apply in Misdemeanor cases, and therefore, depending upon which Court is hearing any particular case, the Defendant may either be given Notice of the next Court date, called a “Pre-Trial,” at the Arraignment, or be informed that such Notice will be mailed to them. 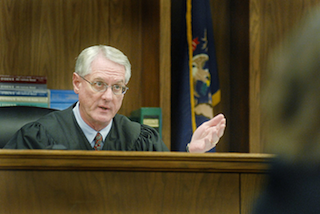 Some Suburban Detroit Courts have taken to combining the Arraignment phase with the next step in a Criminal Case, the “Pre-Trial.” This kind of “two-fer” proceeding, called an “Arraignment/Pre-Trial,” only happens in cases where a person is either not arrested but given a Misdemeanor Citation, or where they are released on the “Interim Bond” we mentioned earlier. We noted earlier that in most Suburban Detroit Courts, if a Defendant has been released on an “Interim Bond” or was simply issued a Misdemeanor Citation, it is possible for the Defense Attorney to “Waive” the Arraignment so that instead of having to go to Court and deal with what we’ve been talking about, a plea of “Not Guilty” will automatically be entered on behalf of the Defendant, any interim Bond will be continued (meaning it will still hold) and Notice of the next step, the Pre-Trial, will be sent to both the Defendant and their Lawyer. Arraignments cannot be “Waived” in Felony Cases. All person charge with a Felony Offense must be Arraigned by a Judge or Magistrate, and have their Preliminary Examination Date set within 14 days from the date of the Arraignment. The 36th District Court in Detroit does not allow Arraignments to be Waived, requiring each Defendant to appear in Court for that purpose. Some Suburban District Courts allow a Waiver of Arraignment on certain cases, but not others. Usually, if a Court allows some Arraignments to be waived and others not, Assaultive Crimes and Alcohol-Related Traffic Offenses (DUI) are amongst those that most frequently will require a Defendant to appear personally. To recap a bit, after a Defendant has been advised of the Charge (Felony or Misdemeanor) he or she is facing, as well as the Penalty that can be imposed for that Crime, and then advised of his or her Constitutional Rights, a Plea (usually “Not Guilty”) is entered on their behalf. Next, the Judge or Magistrate assesses a Bond amount, and specifies the various Bond Conditions that the Defendant must observe once they are out of Jail. Finally, in Felony cases, the Court sets the date for the next Hearing, called a Preliminary Examination. That Hearing must be set within 14 days from the date of the Arraignment. In Misdemeanor cases, the Court will typically advise the Defendant of their next Court date, called a “Pre-Trial.” Sometimes, although less often, instead of issuing the next Court date right there, a Court will confirm the Defendant’s address and advise him or her that they will receive a Notice of the Pre-Trial date in the mail. I have tried to distill the most common and important aspects of the process of Arraignment down to a manageable article. Even though I think this 2-part article adequately covers the essentials, a comprehensive explanation of the process and considerations involved would require more examination than I think anyone would want to make, and certainly more explanation than I am equipped to make. Still, as an overview of the essentials of Arraignment, I think this article explains the process fairly well.